I give you this article from the BBC. If you don’t laugh as soon as you read the headline, the terrorists win. When I first heard that the BBC was doing a television series based on Robert Louis Stevenson’s The Strange Case of Dr. Jekyll and Mr. Hyde, I was more than a bit excited. I’ve always been a fan of that story and everything that it inspired (from the Incredible Hulk to Jim Carrey’s The Mask). We’ll momentarily ignore what it says about me that one of my favorite stories involves an intelligent but repressed man who gives in to (and later relishes) his darker, baser instincts. Anyway, I was excited. Then, I realized that I didn’t have BBC America–sure, I have the Soap Channel and the Game Show Network and about 5 MTVs…but no BBC America–so, I promptly forgot all about this new Jekyll and Hyde. Flash-forward a few months. I’m watching something and see a trailer for the DVD release of the BBC’s Jekyll. Suddenly it all comes back to me. And, hey, I have a DVD player. I have Netflix. Let’s give this a go, shall we? Yes, we shall. Jekyllis a six episode series (I feel it may be finite, even though I’ve only seen the first three episodes, we all remember how the original story ended) set in modern-day London. 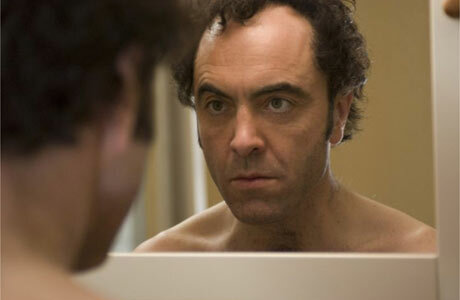 Dr. Tom Jackman (James Nesbitt) has recently discovered he has something of a split personality. Jackman happens to be the last descendant of Dr. Henry Jekyll (who was apparently a real person) and has inherited his ancestor’s “affliction.” Unlike Jekyll, Jackman and his alter ego have a system worked out…a visitation schedule, if you will. Jackman leaves himself messages on a digital mini-recorder and uses GPS to track the movements of his other self, with the aid of a sultry assistant (played, ironically enough, by Michelle Ryan!). The first three episodes deal mainly with introducing Jackman, his wife and children, “Billy” (the name Hyde gives himself before discovering that he is, in fact, Mr. Hyde), and the shadowy organization keeping track of Jackman (an organization that has been tracking Jekyll and his descendants for the last century). Oh, and there’s Jackman’s old boss, played by Wedge Antilles. What makes this series work is the performance of James Nesbitt. The differences between Jackman and Hyde are almost exclusively within Nesbitt’s performance, with the addition of black contact lenses, a wig, and minor prosthetics to his chin, nose and ears. Most adaptations of Stevenson’s novella seem to play up Hyde as some kind of beast-man or troglodyte…when, in actuality, Mr. Hyde could blend in perfectly well with the citizens of London–in fact, unless you really looked at him, you’d think this Hyde chap was perfectly normal. So, Nesbitt had to create a different way of moving, speaking and behaving as Hyde…and he does so marvellously. He holds himself differently. He moves differently. His smile as Hyde can chill your blood. Nesbitt’s Jackman is a slouchy, twitchy, middle-aged sad sack. His Hyde is lean and predatory, the quintessential alpha male–it’s rather chilling watching Hyde stare at someone with those black eyes, body perfectly motionless. I can’t think of another actor who has been able to create such a varied performance with little more than his posture and voice.